Last summer, four people were injured in Delaware when a car struck a motorcycle and started a chain reaction accident. The driver of the car failed to yield to the oncoming motorcycle at an intersection, causing the serious crash. Accidents like these are common when it comes to motorcycles. Motorcycles are, by nature, more dangerous than cars. They leave riders less protected and are smaller and less stable than cars. The National Highway Traffic Safety Administration (NHTSA) estimates that per mile traveled, motorcyclists were 26 times more likely to die in a crash. Additionally, the Insurance Institute for Highway Safety (IIHS) states that 4,381 motorcyclists were killed in accidents in 2013. 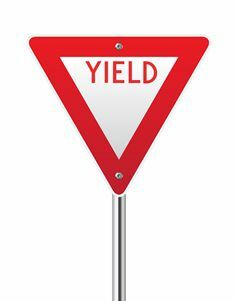 Though there are many causes of motorcycle accidents, failure to yield is one serious and preventable cause. What Is Failure to Yield? Is entering the roadway from a driveway or parking lot. Is merging with existing traffic. Is turning left at an intersection. Is approaching a flashing yellow light. In these situations, there is always a driver with the right of way (someone who is supposed to go first) and a driver who must yield (someone who must wait for his turn to proceed). In the summertime accident, the car driver failed to yield to the oncoming motorcycle and proceeded to make a left turn through an intersection as the motorcycle approached. The driver of the motorcycle, who was traveling the opposite direction of the car, was struck and thrown into the road. The driver of the car was cited for failure to yield. The NHTSA states that a car driver’s failure to yield was responsible for 35 percent of two-vehicle crashes involving a motorcycle across the country in 2013. Don’t be afraid to use the horn. Don’t drive impaired. Stay alert. If you or someone you love has suffered injuries in a motorcycle crash due to another driver’s failure to yield, you may be entitled to compensation. Chat live with an experienced member of the Morris James Personal Injury Group legal team to learn more about these dangerous accidents and your rights. Does my Car Insurance Cover All the Costs of an Accident?